PLANTATION, Florida -- A Florida man has been arrested in the investigation into a dozen suspicious packages that were sent to prominent Democrats nationwide. 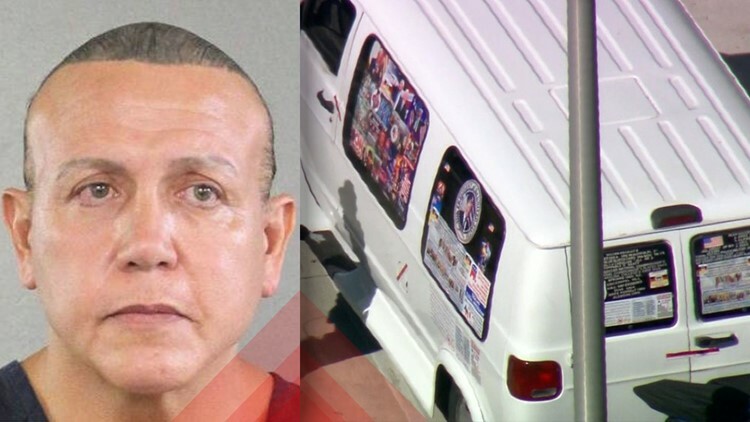 The suspect, Cesar Altieri Sayoc, is charged with five federal crimes, including interstate transportation of an explosive, illegal mailing of an explosive, threats against former presidents, threatening interstate communications and assaulting current and former federal officers. FBI Director Chris Wray confirmed there were 13 IEDs found during the investigation. Each had roughly six inches of PVC pipe, a small clock, a battery, some wiring and other explosive materials. If convicted, Sayoc faces up to 48 years in prison. Sayoc has a last known address in the suburb of Aventura in Miami-Dade County. It was not immediately clear if he was the only suspect in the case. He is a registered Republican, according to public records. A search of Sayoc's social media profiles found strong support for President Donald Trump. In June, he posted a short video to Twitter, calling Trump the "greatest president ever." 10Investigates found footage Sayoc appears to have recorded at a Trump rally. Sayoc has a prior felony charge related to making a bomb threat. That charge was filed in 2002. Online judicial records indicate he served one year of probation in that case. Court records list multiple other prior arrests, including for theft, battery and domestic violence. 10News obtained court records that indicate he was once a road manager for the Chippendales, a touring dance troupe best known for its male strippers. His responsibilities included selling merchandise, handling bookings and supervising operations, court records showed. A man, who 10News independently confirmed knew him, said Sayoc worked as a male stripper in the 1990s. Investigators say they were led to Sayoc, in part, through fingerprints. President Donald Trump said Sayoc would be prosecuted "to the fullest extent of the law." Much of the overall federal investigation has focused on Florida after packages were found at a mail facility in Opa-locka, which is also in Miami-Dade County. Authorities are still trying to figure out if the packages were actually meant to explode or just cause fear. Law enforcement officials are still working to figure out if more packages have yet to be found. "If you notice a strange package, do not remain silent, say something,” DHS Secretary Kirstjen Nielsen said. Noon Federal authorities have arrested Cesar Sayoc in Broward County amid an investigation into a dozen suspicious packages that were sent to prominent Democrats nationwide. It is not immediately clear if he is the only suspect in the case. 8:30 a.m. A suspicious package addressed to U.S. Senator Cory Booker (D-New Jersey) was intercepted Friday at the Opa-locka mail facility in Florida, and another addressed to former Director of National Intelligence James Clapper was located in Midtown Manhattan. Early morning: A suspicious package addressed to former Vice President Joe Biden is discovered in New Castle, Delaware. A second package addressed to Biden is later discovered in Wilmington, Delaware. 9:40 a.m. The Secret Service said packages addressed to Hillary and former U.S. President Bill Clintonwere intercepted by law enforcement officials. The package was intended for their Chappaqua residence. Screening procedures stop a package containing an explosive device addressed to former President Barack Obama’s Washington D.C. residence. 10:25 a.m. The CNN offices in New York are evacuated after a suspicious package was found. 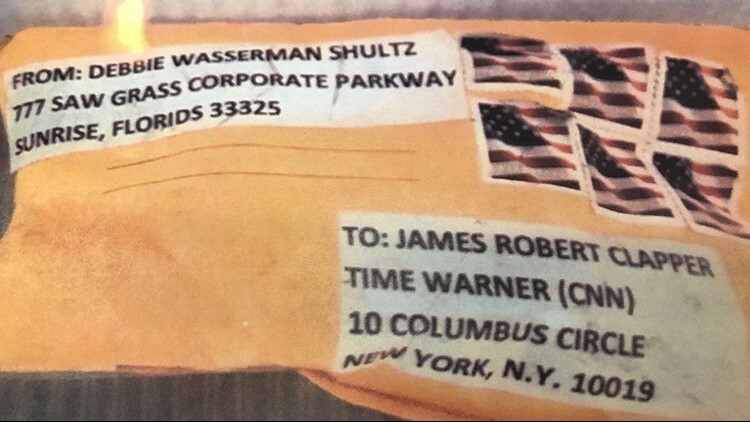 11:45 a.m. Another suspicious package was found, this time at the Florida office of U.S. Rep. Debbie Wasserman Schultz. 12:45 p.m. New York City Mayor Bill de Blasio calls the packages “clearly an act of terror” against Americans. Evening: President Donald Trump implored politicians to stop questioning the moral character of their opponents, using a rally in Wisconsin to call for a more civil politics hours after a series of suspicious packages were sent to Democrats and media outlets. "No nation can succeed that tolerates violence," Trump said, breaking script from his usually highly partisan rallies to discuss the packages. "The language of moral condemnation and destructive routine, these are arguments and disagreements that have to stop. Those engaged in the political arena must stop treating political opponents as being morally defective." Trump put some of the blame for the current political climate at the media. "The media also has a responsibility to set a civil tone and to stop the endless hostility and constant negative and oftentimes false attacks and stories," Trump told the audience. "They've got to stop." 3:45 p.m. A suspicious explosive device was discovered at the home of billionaire investor and philanthropist George Soros in Bedford, New York, Authorities render the device safe.